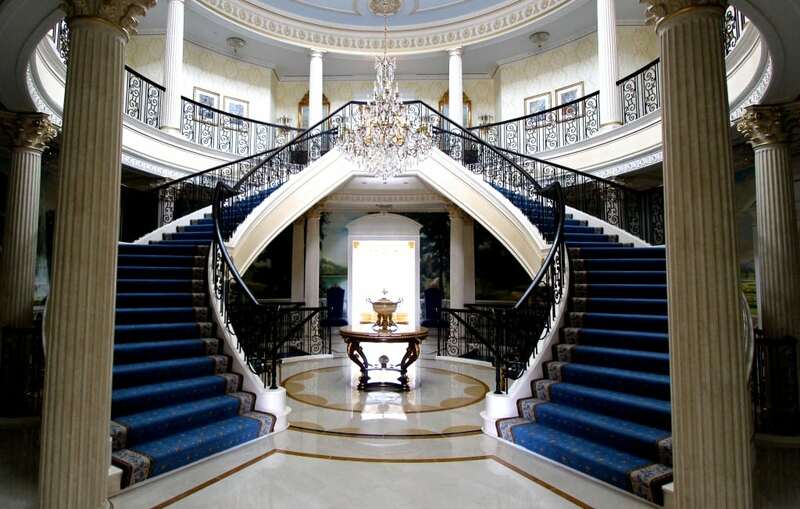 Staircases take on many shapes and sizes, and one of the most elegant stair options is the curved staircase. This month, we highlight four unique custom stairs projects built and installed by our talented team. From rustic farmhouse to modern luxury, our team leverages robust design and project management capabilities to construct the highest quality circular stairs across the nation. The small footprint of a spiral staircase makes it an excellent choice for tight spaces where square footage is in high demand. In order to maximize living space in this Tennessee residence, our team designed a custom double helix circular staircase. This beautiful staircase is anything but your normal spiral. 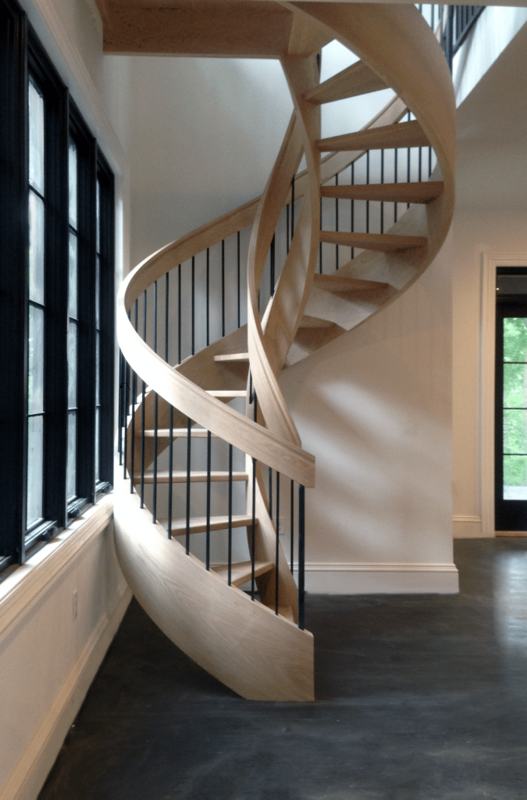 Featuring white oak custom solid wood handrail, white oak solid wood stringers and treads, and plain bar iron balusters in a smooth black finish, this spiral is truly a superior circular stairs project. What makes these custom stairs so unique? Unlike many spiral stairs, this cutting-edge double helix stair design does not require a center post for structural support. Without a center column, the modern curves of this high-end residential staircases are truly on display. From Tennessee, we head northeast to Maryland where our team constructed a beautiful twin circular staircase and handrail system that speaks true luxury. This high-end residential staircase design displays superior quality craftsmanship, featuring a mahogany custom wood profile handrail with maple treads and risers. The exquisite mahogany handrail is complemented by a combination of wrought iron custom-made baluster panels and plain square bars. This complex custom project also includes a custom curved apron and cove molding. This double-stacked custom stairs offer a creative yet simplistic design. A display of premium craftsmanship, this staircase was a perfect fit for a rustic, farmhouse style residence in Atlanta, Georgia. The curved staircase features a white oak legacy curved wood handrail and white oak solid wood treads with paint-grade risers. Finished in oil-rubbed bronze, the plain round bar metal balusters are complemented by Hamilton metal newel posts in the same smooth, attractive finish. 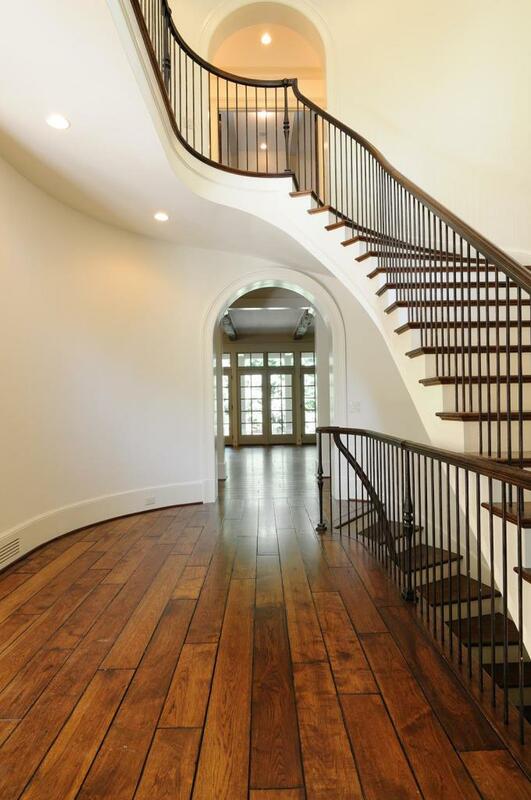 Also located in Georgia, this traditional double open circular stair demonstrates prestige and elegance. 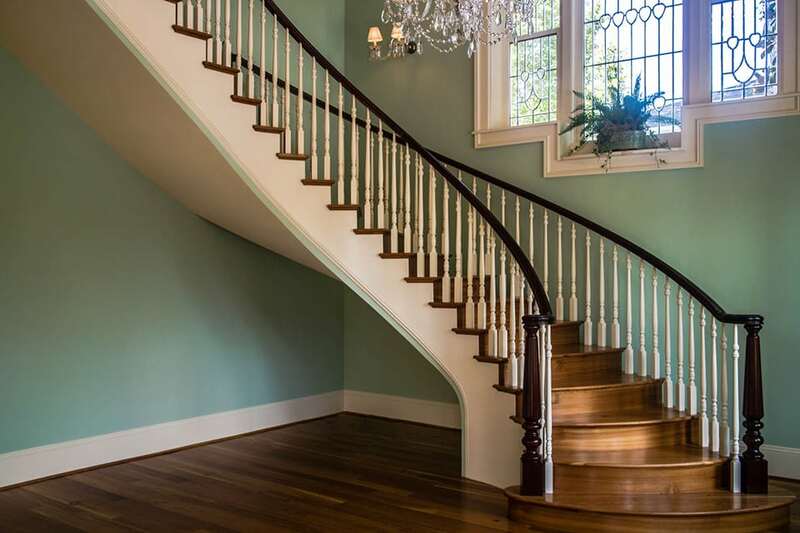 The staircase was designed with the goal of complementing the reception hall and accentuating the original charm of this 1903 Southern home, and it does just that. The classic wood handrail system, with its flawless fit and finish, offers a prestigious and elegant style. Paint-grade risers offset the beautiful mahogany custom curved wood handrail and antique heart pine wood treads. The starting newels are a beautiful Belle Meade design, followed by Hampton balcony newels in rich mahogany. Hampton pin top balusters complete the handrail system, adding to the circular staircase’s luxurious and traditional style. 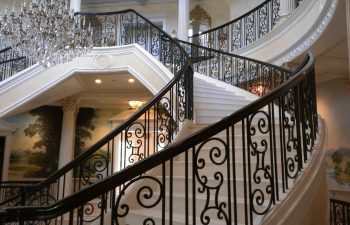 Whether a custom build or popular project, we follow a turnkey process to ensure that each curved staircase is delivered seamlessly and on time. Our team constructs each circular staircase in our state-of-the-art facilities. The completed staircase and handrail systems are then delivered to the job site and installed by our expert craftsmen. This turnkey process ensures on-time delivery and the highest quality. Visit our circular staircase project gallery for additional details and pictures on our exquisite projects. From inspiration to installation our team is committed to designing and building the highest quality circular stairs. Our reputation speaks for itself and client satisfaction is our highest priority. Contact us today to discuss your next circular stairs project.